I need to catch up on sleep and process some pictures from 5-19 (it has been a long ten days on the road with Trip 2), but I wanted to clear the air of some erroneous claims and facts that I have been hearing about yesterday's (5-20-2013) tornadoes in OK. I've heard everything from "no warnings were issued" to "lead time was 45 min." First, let me preface by saying I was not chasing on this particular day. Sunday was the last day of our trip and we *had* to come home Monday afternoon. However, the drive back to Chicago allowed me to watch the events in Moore, OK unfold with a keen eye. Luckily, I archived a lot of data and am just now starting to sift through some of it. The media reporting of the warning aspect of this storm is particularly troubling to me (in addition to many other rediculous claims certain local Oklahoma City stations were blurting out). That discussion is for another post. 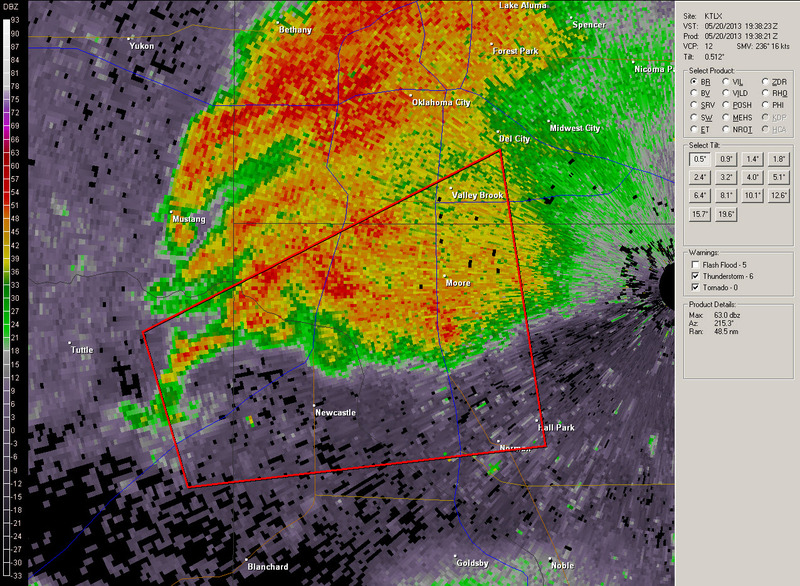 5-20-2013 19:40 UTC WFO OUN issues tornado warning (red polygon) including the city of Moore. I have included the 19:40 UTC tornado warning polygon and the 19:38 radar suite (BREF image shown) that likely prompted the tornado warning. 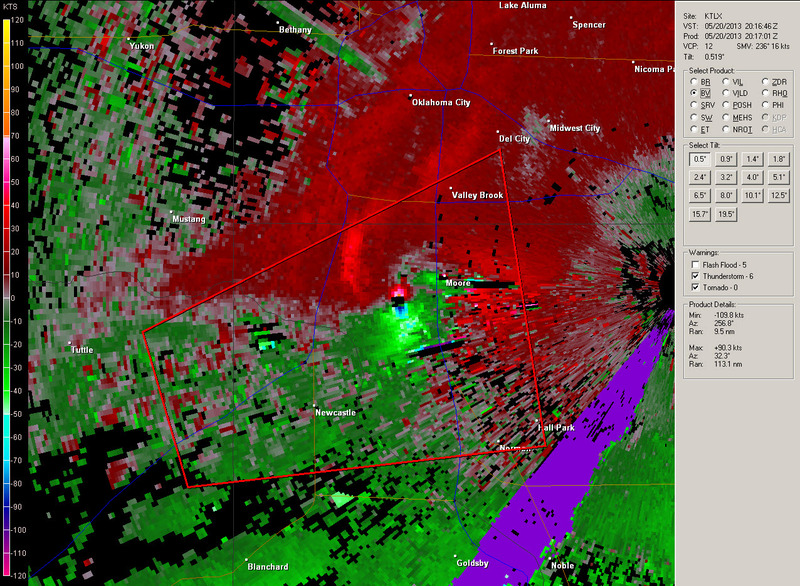 At 20:01 UTC, WFO OUN issues a tornado emergency for the town of Moore. At 20:16 UTC, the tornadic circulation was just southwest of Moore (probably just entering town around this time). 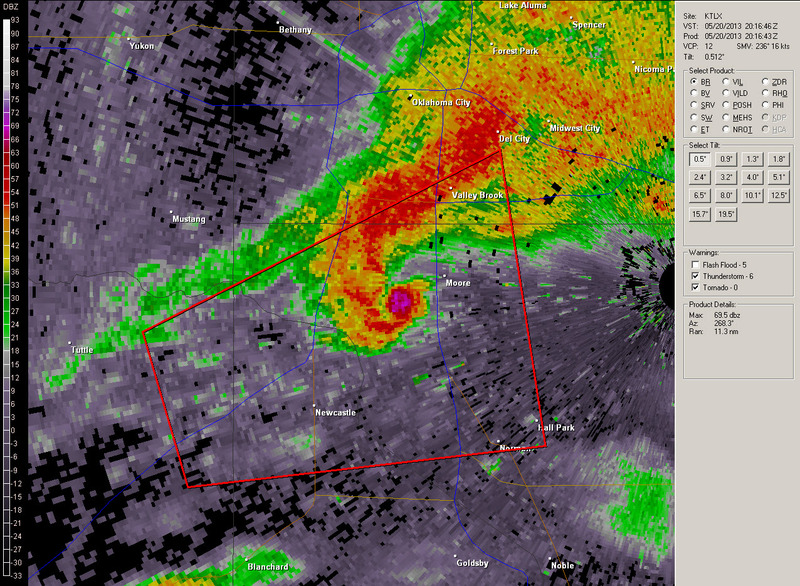 Via radar, it appears the tornadic radar signature was in Moore around 20:20 UTC. So, taking this approach (which I will agree is not the "T"ruth), this puts the tornado lead time for the folks in Moore at roughly 40 minutes! Not this bull#$%* I am hearing about 10-15 min! Even the tornado emergency had nearly a 20 minute lead time for Moore. This was a great tornado warning by the same great forecaster who issued a tornado warning back on 3 May 1999 for an eerily similar situation. Obviously, not all locations in the warning receive the same lead time. It is a function of how far you are away from the tornado when the initial warning is issued. This can make the lead time for a particular warning tricky. If you score this on a city-by-city basis, then Moore has an amazing 40 minute lead time for this event. Hats of to the Norman, OK National Weather Service Office for a job well done! It disgusts me how inaccurate journalists are becoming (see recent Boston Marathon bombing timeline). Everyone races to the answer without doing the important detective work. Ratings baby! While I have your attention...consider donating to the central Oklahoma chapter of the Red Cross. I had a pit in my stomach most of the day yesterday after hearing about the situation with the elementary school children. The photos speak for themselves. This is why I'm a severe storms scientist. First, the Internet and live streaming makes it as though we had a TV antenna pointed at the towers a mile away, even though we're 800 mile away. And, you get to see and hear the ridiculousness that some stations put out in their news and weather departments. KFOR-TV had helicopter footage, but their chief "meteorologist" was saying things that were not only inaccurate, but completely irresponsible. I had to mute the volume. They might as well said "we're all gonna die". The local TV stations at least broadcast the warning within seconds. Radio stations, being on shoestring budgets, simply cut over to the TV stations audio for coverage. Heck, even the BBC, usually better than most national U.S. media, blew it. It came with no warning? Really? Whaddya want, 5 days notice and motel costs while you are gone? Do a little research guys. Ask the local affiliate (they should know or can look it up) if they had warning. Better yet, call the NWS, or even better, go on their website! It had all the info right there, raw/uncensored. Finally, Vic, while those radar images are very good...do yourself a favor. 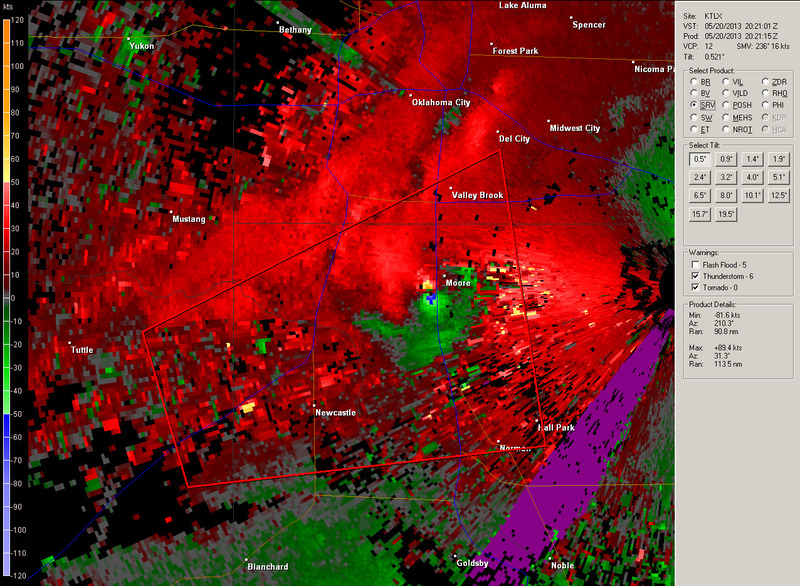 Get the 1 minute SRMV1 and BR1 from TOKC, which almost took a direct hit from the tornado. WARNING: I offer no help when your floor gets damaged as your jaw falls through it after you see those 1-minute images. 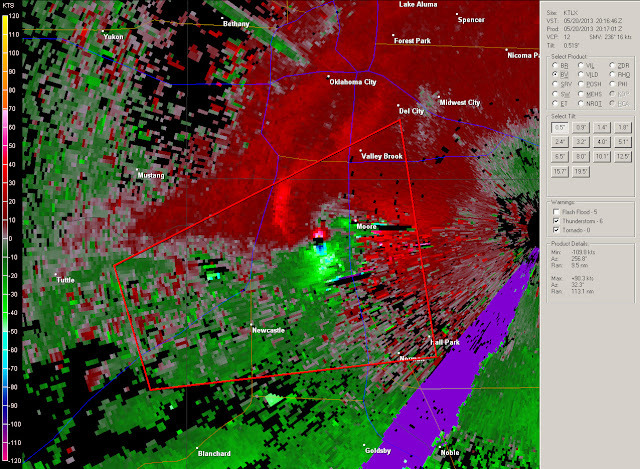 It resolves the tornado in a few scans. I will agree with Victor. The science of detecting tornadoes has probably maxed out. It is time to figure out why people respond or not respond to the warnings. Or maybe we should become more educated and try to avoid being a target. Given more than 15 minutes, I would have taken my car and driven away.If people did not know whether to drive away, maybe we should be working on educating them. There is no reason people could not have known about this tornado a long time in advance. We did have notice. Easy to say drive away but, with the time it takes to leave work to pick your children, you are out of time. Moore is a family community. I picked up my grandson from daycare to go to the predesignated shelter and had to turn around, ending up in a closet at my house. A perfect scenario would include All businesses being closed on alert days but that isn't possible. Thankful for the weather technology. It saved a lot of lives.